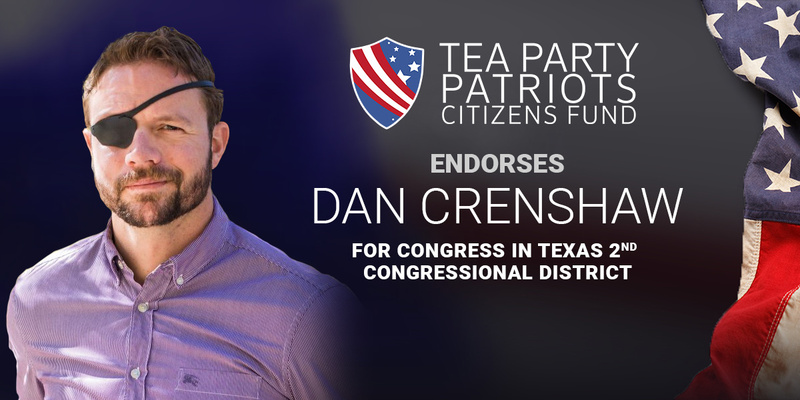 ATLANTA, Ga. – Tea Party Patriots Citizens Fund (TPPCF) Chairman Jenny Beth Martin today released the following statement, announcing that the Super PAC associated with the nation’s largest Tea Party group has endorsed Dan Crenshaw for Congress in Texas’ 2nd congressional district. “Conservatives in Texas’ 2nd congressional district have a clear choice for Congress – Dan Crenshaw. “Dan has lived a life of service to his nation and his community. As a veteran with combat service in Iraq and Afghanistan – as a member of SEAL Team Three – he was wounded on the field of battle. He knows full well the sacrifices we ask of our men and women in uniform. Serving in Congress will continue his legacy of public service, and allow him to have an impact on public policy. “Dan understands the need for border security, and supports President Trump’s demands for construction of a wall where appropriate along the southern border. He opposes chain migration and birthright citizenship, and wants to reform the visa lottery. He opposes amnesty for illegal immigrants. “Dan wants to fully repeal ObamaCare, and wants to overturn Congress’ illegal special exemption from ObamaCare. He is determined to work on entitlement reform, acknowledging the hard truth that many candidates shy away from – without reforming mandatory spending, it will be virtually impossible to balance the federal budget. “He supports a Balanced Budget Amendment to the Constitution, and a spending limitation amendment. He supports the Penny Plan – a budget framework in which the federal government spends one penny less out of every dollar spent the previous year, as a means to achieve a balanced budget within approximately five years – and supports term limits. “Dan is a strong supporter of Second Amendment rights, and believes concerns about school safety should be handled at the local level. For similar reasons, he opposes Common Core. Tea Party Patriots Citizens Fund is committed to equipping grassroots activists at the state and local level with the tools and resources needed to hold elected officials and government accountable and elect new and qualified candidates.